This is the beginning of the "cabin" construction sequence, chosen rather arbitrarily because at about this point we begin making "furniture" as opposed to adding more hull features. I've drilled the holes for the lead ballast through each floor, and the floors have also been counter drilled to accommodate the keel bolt nuts and washers. 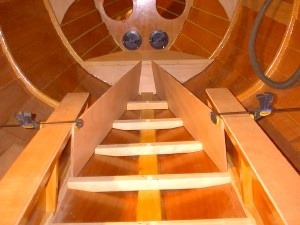 The part bulkhead at station 3 is temporarily� installed and the forward berth top fitted. 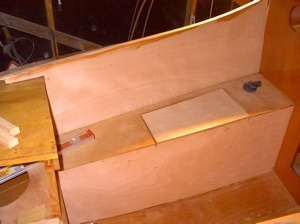 The berth fronts have been cut to shape and the bilge board case caps are waiting to be drilled and screwed into place. The cabin trunk sides and front are now in place. 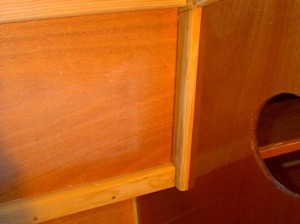 Here's a detail from the aft corner, showing the simple but effective use of framing in the cabin design. We've carried on with our best Douglas Fir so the light wood contrasts with the darker plywood. The interior to date, showing the sides and front of the cabin as well as the part bulkhead at station #5 which divides the berth from the galley and chart table areas. 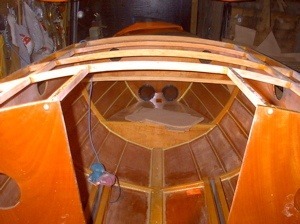 The bulkhead still needs a cap fitted to the edge. Once the cap is added the bulkhead will be permanently installed. The first laminated beam in place, though not faired yet. The curve of the cabin side is easily seen in this view. 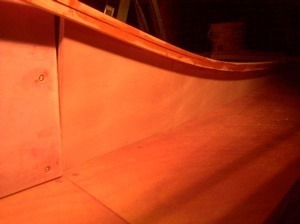 The light cabin trunk has been sanded. 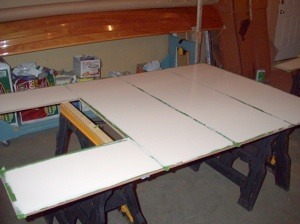 Once given another coat of epoxy it will match the rest of the plywood. 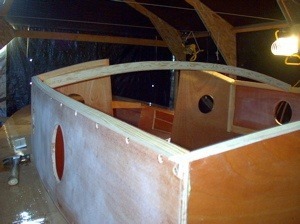 The cabin roof beams and associated structure is finally done, faired, and coated with epoxy. 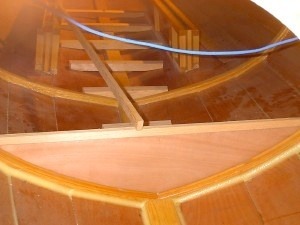 Next, we'll varnish the topmost beams all around in preparation for the gluing of the roof panels. 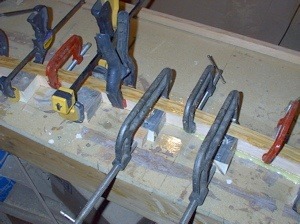 The side longitudinals are 4 feet apart to make scarphing the plywood unnecessary. 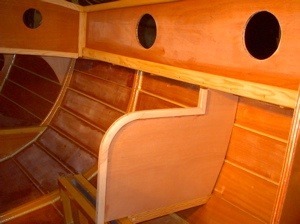 This is the exterior view of the top of the seat backs, now with some trim pieces glued in place. A fillet to fair the forward end of the coaming into the house sides will be made from Honduras� mahogany. On the flip side the cockpit seats are shaping up. There will be two cave lockers cut into the seat back on each side of the cockpit. It already feels like a safe and secure place to sail the boat from. Luckily, we did get the roof panels installed before the colder weather set in. We're very pleased with how the laminated beams look next to the paint work. Another view of the ceiling. 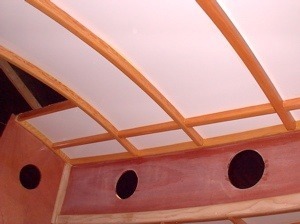 The beams are finished wherever they contact the painted ceiling, but the rest of the interior will be done later. The exterior of the roof is now glassed and coated and will be ready for final finishing in the spring.